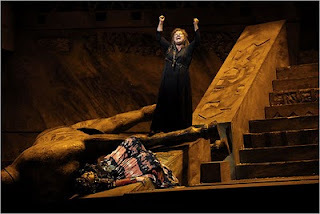 Well, I was surprised to read much negative blogging about the Metropolitan Opera Company debut of soprano Susan Bullock in her most famous role: Richard Strauss’s Elektra. Despite these negative remarks (mostly from people who heard the Sirius broadcast – and admitted to not being in attendance) the house – including me – seemed to have a wicked good time. Bullock was formidable in the role, singing it with a loveliness of timbre rarely encountered in this voicebusting warhorse. I loved her dance at the beginning and was worried she wasn't going to dance at the end, but then she stalked awkwardly up the stairs grabbed the ax and began waltzing with it until she danced herself into a frenzy. One blog referred to her dancing as ridiculous and risible? Not to me ! It was (if you’ll pardon the pun) - Elektrifying! Witness the fact that she was brava-ed to pieces when the lights came back on for one of the best bows in opera (you have to look to the Minghella Butterfly for a better solo bow!) If one wasn’t moved by this performance, she's simply not your cup o' tea, but wow. Many commented that Ms. Bullock simply "is not an Elektra for the Met" - a statement I simply don't understand. I was in standing room under the overhang and the voice filled the house - beautifully. It's a softer-grained voice than usually heard in the role, but it carried over the orchestra EASILY and I never once strained to hear a note from her. The highest notes seem to be a bit of a trial for her - more willed than sung - but I didn't mind that for a minute because the rest was so beautifully shaped. I couldn't stop crying during the Recognition Scene, which she shaped and phrased with exquisite control. And what about Debbie Voigt? My jaw dropped - this is easily the BEST singing I've heard from her in . . . I'd bet five or six years. Big, gleaming, the top notes don't have the spin they once did, but they were formidably sung and HUGE. She and Bullock played nicely off each other. Felicity Palmer was wonderful throughout – her voice rich with sound and she sang (rather than shoved her way) through the role in a manner I’ve not heard really since Christa Ludwig. Even so, the pacing in the middle of her long (long) monologue needed some help which conductor Fabio Luisi didn't provide, seeming to indulge the singer rather than taking the proverbial bull by the horns and moving it forward. Here was (for me at least) the only moment where the drama seemed to sag. By the way, if that Palmer screaming at the end (which I doubt): then Wow! Maestro Luisi shocked me with the attention to detail he brought out - and which I did not expect at all (I like him generally, but would never have imagined him for Strauss - particularly THIS Strauss!) What a pleasant surprise and I'd like to hear him after he's figured out a couple of the pacing issues. Though I preferred the previous “director” of stage action in the Met’s last go ‘round with this beast (Polaski, Mattila, Lipovsek and Held) I also rather loved the slight changes David Kneuss brought to the blockings (many of which were identical when this production was new and with Behrens - still MY favorite Elektra ever). The best change came in the staging of the Recognition Scene – the entirety of which was profoundly moving, acted well by both brother and sister, and gorgeously sung by Ms. Bullock. The Serving Maids were (as they tend to be at the Met) sounded good, improving as the scene went on but with some real stand out singing from Jennifer Check and Maria Zifchak. Wolfgang Schmidt should not be singing. Not even Aegisth. Wow, was he bad. Just awful, actually. Evgeny Nikitin was also something of a major disappointment. Decent actor, but the sound is rather unlovely. I still liked what he did physically, and the falling down as his sister calls his name - followed by her falling to the ground felt exactly right. All in all a welcome debut for Ms. Bullock and I hope to see and hear a lot more of her.